The behaviour of fish might show significant changes when individuals experience weightless-ness condition and if there are mass asymmetry in their otolith (Egorov and Samarin 1970, Hoff-man 1977, Von Baungarten et al. 1982, De Jong et al. 1996, Hilbig et al . 2002, Rehman and Anken 2002, Takabayashi 2003, Lychakov and Rebane 2004). Among the striking changes hap-pened to the acoustic functionality of a fish as a result of otolith mass asymmetry is the incompa-tibility and incongruity of the right and left oto-lith (Lychakov and Rebane 2005, Lychakov 2006). Additionaly, the vestibular and auditory functions get impaired, but Lychakov et al. (2006) stated that the definit quantitative morp-hological and physiological consequences of oto-lith asymmetry are still unclear. In symmetrical fish species, the value of oto-lith mass asymmetry usually falls between -0.2<X<+0.2 or <20% (Lychakov 1992, Lycha-kov et al., 1988, Lychakov and Rebane 2004, 2005, Takabayashi 2003). Otolith mass fluctua-tion might be considered the reason behind such effects Due to the fact that those authors did not obtain a relationship between the magnitude of otolith mass asymmetry and length and weight of the fish (Lychakov and Rebane 2004, 2005). Be-sides, when the otolith mass asymmetry falls well below the critical values as the case in the sym-metric fish species, the functional impairment will not develop (Lychakov and Rebane 2005, Lychakov et al. 2006). The quality of reception might be affected by the amount mass asymmetry of otolith as proposed by Egorov and Samarin (1970), Lychakov (1992), Samarin (1992), Ly-chakov (2002) and Scherer (2001). Researches on the otolith mass asymmetry are a new issue in Oman icthyological studies and the only works on Omani fishes are of Jawad et al. (2010, 2011). Thus, the present work will add further information in this field for Omani fish fauna. The aim of this study is to quantify and to asses the variability of this asymmetry of the lut-janid fish species, L. bengalensis. One hundred and fifty fish specimens of L. bengalensis and 300 otoliths were obtained. Fish specimens were collected from the coasts of Muscat City at the Sea of Oman over the period of January 2010- July 2010. The method of Ja-wad et al. (2010, 2011) for measuring total length was adopted in this study. The otoliths were ex-tracted from the auditory capsules then rinsed in distilled water, air-dried at room temperature for few days and weighed on a Sartorius TE 313S analytical balance to an accuracy of 0.0001g. In the statistical analysis, the formula x= (MR – ML) M-1 is used to calculate the otolith mass asymmetry (x), where MR and ML are the otolith masses of the right and left paired otoliths and M is the mean mass of the right and left paired otoliths. The usual variation of x value falls between -2 and 2, and when x=0 then absence of asymmetry (MR-ML) occurs and x = -2 or x = 2 represent the maximal asymmetry (absence of one otolith). Positive value of x on the right side means larger otolith and a negative sign means the opposite. The absolute value of the species otolith mass asymmetry is calculated. To evaluate otolith growth rate the linear model for the relationship between otolith mass and fish length was used. The mean value of x is 0.0003+ 0.0209, n=150 (Figure 1) and the value of IXI is 0.0140 +0.0209, n=150 (Figure 2). According to the re-gression analysis there was no relationship be-tween fish length and both IXI (y = 0.0023x -0.0355) (P>0.05, R2=0.0167) and x (y= -0.0004x + 0.0109) (P > 0.05, R2 = 0.0002). The relation between otolith mass difference (MR – ML), and fish length was more complex than the relation between x and fish length (n = 150, total length = 195-230 mm, P > 0.05, y = -3E-05x + 0.0009, R2 = 0.0003) (Figure 3). 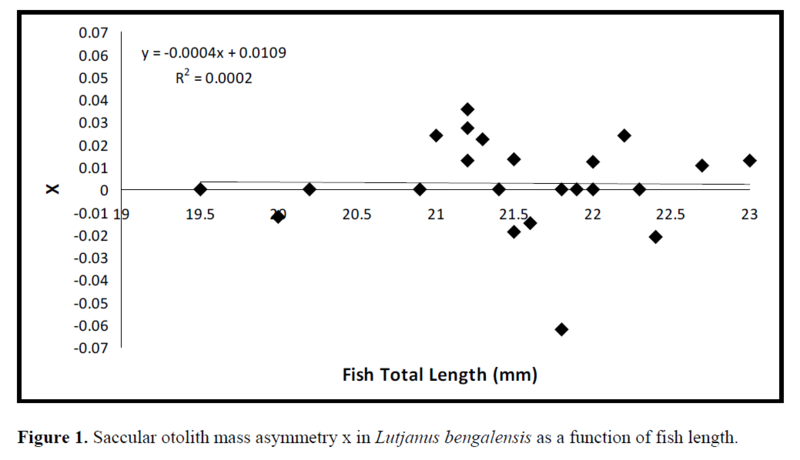 Figure 1: Saccular otolith mass asymmetry x in Lutjanus bengalensis as a function of fish length. 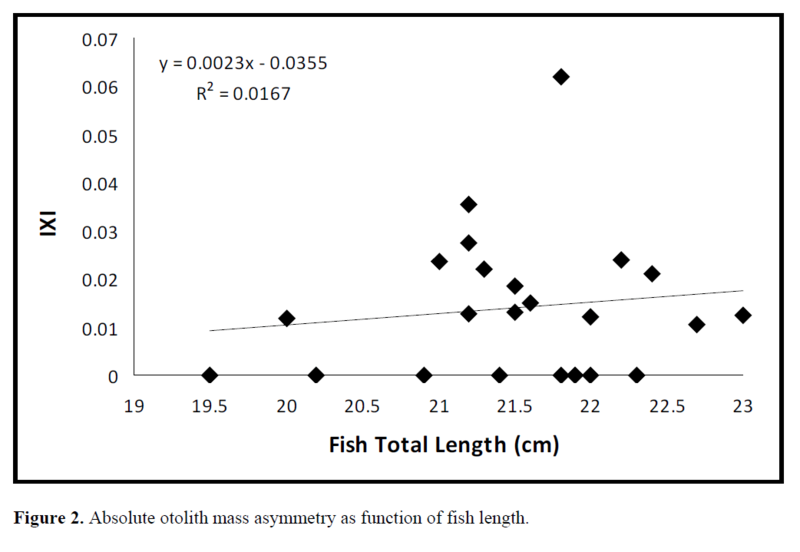 Figure 2: Absolute otolith mass asymmetry as function of fish length. Figure 3: Saccular otolith mass difference in Lutjanus bengalensis as a function of fish length. The range obtained for the value of x is be-tween -0.2 and +0.2 as in other marine fish spe-cies (Lychakov et al. 2008). Lychakov et al. (2006) suggested that the value of mass asym-metry of the saccular otolith obtained for large number of marine species is usually less than 0.05. This value is in agreement with the value of mass asymmetry obtained for L. bengalensis in the present work. In both symmetrical roundfish and asymmetric flatfish species and whether they are benthic, littoral or pelagic fishes, there are no apparent differences in X (Lychakov et al. 2006). It is well known that otolith mass asymmetry is considered among the reasons that lead to re-duction in acoustic and vestibular functionality of a fish ear. This fact was determined by Lychakov and Rebane (2004, 2005) through the mathemati-cal modeling they wrote. In the fish species in question the value of IXI is shown to be low (<0.5), irrespective of fish length. This is in agreement with the results obtained for the ma-jority of fish studied (Lychakov et al. 2006). Asymmetry in the utricular and lagenar otolith organs of symmetric fish species is usually low. In theory, only fishes with largest otolith and with IXI >0.5 will experience difficulty in sound reception due incompatibility and incongruity of the movement of the two otoliths (Lychakov and Rebane (2005). Therefore, functional affliction can be avoided by most fish species when otolith mass asymmetry falls below critical value. The results obtained in the present study about the saccular otolith mass asymmetry showed that this value does not depend on fish size. Such re-sult is in support of the results obtained by other workers on several marine and freshwater fish species (Lychakov and Rebane 2004, 2005, Ly-chakov et al. 2006, Jawad et al. 2010, 2011). In spite of the mathematical model of Lychakov et al. (2006) that shows the stability of the value of x during the life of the fish, it is unknown yet how fish manage to keep the value of their otolith asymmetry at low level (Lychakov et al. 2006). The work of Rahmman and Anken (2002) has shown that a monitoring agent acts on the growth of the otolith via negative feedback loop between the brain and the inner ear. Luchakov (2002) suggested that the weight of the otolith on the sensory epithelium is the monitoring agent, but such suggestion faced with evidence disagrees with this hypothesis, and otolith weight seems not to be involved in the regulation of its growth (Luchakov 2002). The relationship between fish length and oto-lith mass difference is always considered as a complex relationship and in the present work, no relationship between fish length and otolith mass difference is found. Such result is in agreement with the results obtained by Lychakov and Re-bane (2004, 2005) and Jawad et al. (2010, 2011) on several fish species. For the absence of the relationship between fish length and otolith mass difference, Lychakov et al. (2006) suggested three reasons; (1) small sample size plays a vital rule in this study; (2) narrow range of variation in the specimen's size studied; and (3) feasible ge-netic factors. These suggestions are evident in the data of the species in question as only 150 speci-mens ranging in total length between 202-313 mm were used in this work. For the future studies, it is advisable to use large number of specimens and wide range of body size to further investigate the relationship between the otolith mass difference and the fish length. As in the case of other symmetrical fish spe-cies, the absolute value of sagittae mass asym-metry (X) in L. bengalensis does not depend on fish length and otolith growth rate. The absolute value of otolith mass asymmetry is increased with the fish length and the value of sagittae mass asymmetry falls between -0.2 and +0.2. 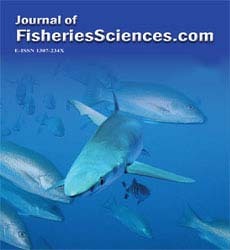 We would like to thank the Ministry of Fishe-ries Wealth, the Agriculture and Fisheries Deve-lopment Fund and the Marine Science and Fishe-ries Centre for giving us the opportunity to work on the fish samples within the qualitative and qu-antitative distribution of marine organisms in the Sultanate of Oman and to provide the appropriate financial support. De Jong, H.A.A., Sondag, E.N.P.M., Kuipers, A., Oosterveld, W.J., (1996). Swimming be-haviour of fish during short periods of weightlessness. Aviation and Space Envi-ronmental Medicine, 67: 463- 466. Hilbig, R., Ankan, R.H., Bäuerle, A., Rahmann, H., (2002). Susceptibility to motion sickness in fish: a parabolic aircraft flight study. Journal of Gravititational Physiology, 9: 29-30. Hoffman, R.B., Salinas, G.A., Baky, A.A., (1977). Behavioural analyses of killifish ex-posed to weightlessness in the Apollo-SoyusTest Project. Aviation and Space Environ-mental Medicine, 48: 712-717. Jawad, L.A., Al-Mamry, J.M., Hager, M., Al-Mamari, M., Al-Yarubi, M., Al-Busaidi, H.K., Al-Mamary, D.S., (2011). Otolith mass asymmetry in Rhynchorhamphusgeorgi (Valenciennes, 1846) (Family: Hemiramphidae) collected from the Sea of Oman. Journal of Black Sea/Mediterranean Environment, 17: 47- 55. Lychakov, D.V., (1992). Morphometric studies of fish otoliths in relation to vestibular func-tion. ZhurnalEvolutioniBiokhimiFiziologi, 28: 531-539. Lychakov, D.V., (2002). Otolithic membrane: structural and functional organization, evo-lution, ecomorphological plasticity and tol-erance to extreme conditions (DoctorskayaDissertaziya), Vol 1. Sechenov Institute, St.-Petersberg (text, tables), 2: 1-266. Lychakov,D.V., Boyadzhieva-Mikhailova, A., Christov, I., Pashchinin, A.N., Evdokimov, I. I., Matkov, A.A., (1988). Changes in the otolith apparatus of rat and fish after pro-longed exposure to acceleration. Kosmich-eskayabiologiya I Aviakosmicheskaya Med-itsina, 22: 27-33. Lychakov, D.V., Rebane, Y.T., (2004). Otolith mass asymmetry in 18 species of fish and pigeon. Journal of Gravitational Physiology, 11: 17-34. 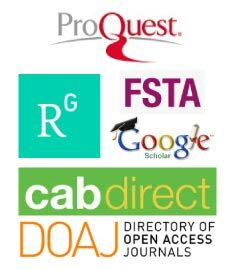 Lychakov, D.V., Rebane, T.Y., Lombarte, A., Demestre, M., Fuiman, L., (2008). Saccularotolith mass asymmetry in adult flatfishes. Journal of Fish Biology, 72: 2579-2594. Rahman, H., Anken, R.H., (2002). Gravitational biology using fish as model systems for un-derstanding motion sickness susceptibility. Journal of Gravitational Physiology, 9: 19-20. Samarin, G.I., (1992). Study of the labyrinth asymmetry and its possible role in the mo-tion sickness genesis (TezisyKandidatskoiDissertazii). Institute for Biomedical Prob-lems, Moscow, 1-33 (in Russian). Von Baumgarten, R.J., Wetzig, J., Vogel, H., Kass, J.R., (1982). Static and dynamic mechanisms of space vestibular malaise. Physiologist, 25: 33-36.